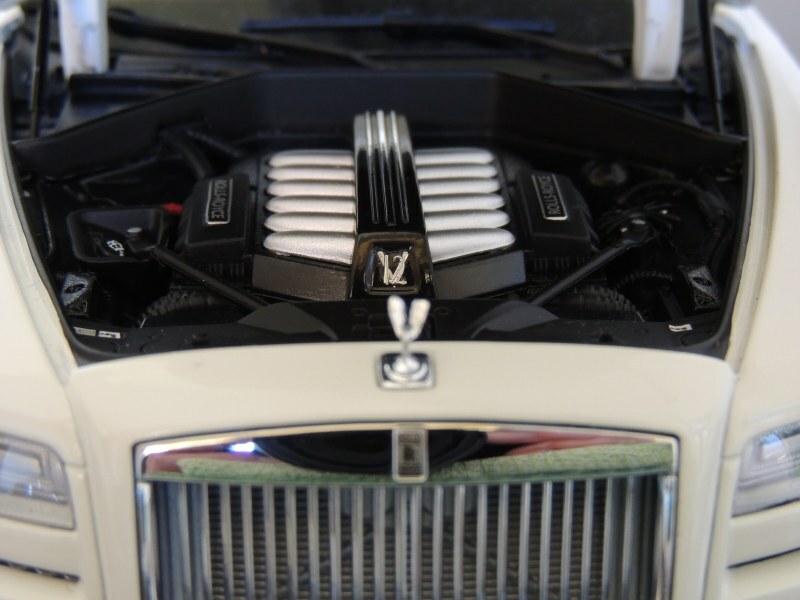 Rolls-Royce. Ever since the Spirit of Ecstasy first adorned the legendary ‘Silver Ghost’ in 1911, the superlative marque has captured minds and hearts like none other. Year after year, decade after decade, nothing summarized excellence better than ‘Rolls-Royce’ – so much so that the name became an adjective, indicating perfection in any field. Almost from the very beginning, it was the pinnacle of automotive prestige. 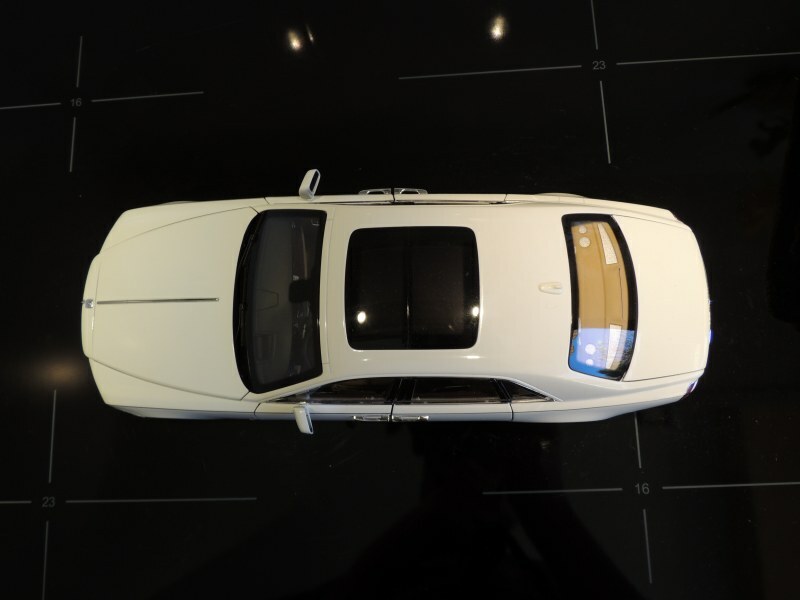 After BMW took ownership of the Rolls-Royce marque in 2002, they immediately began production of a new flagship to replace the aging Seraph – called the Phantom. 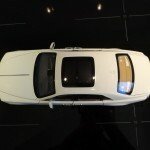 It proved popular with both the motoring media and the well-heeled, who were impressed with its hand-crafted exclusivity and cossetting opulence. 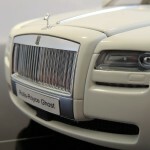 Spurred on by this success, production began on the Ghost; a smaller, but equally brilliant, model. 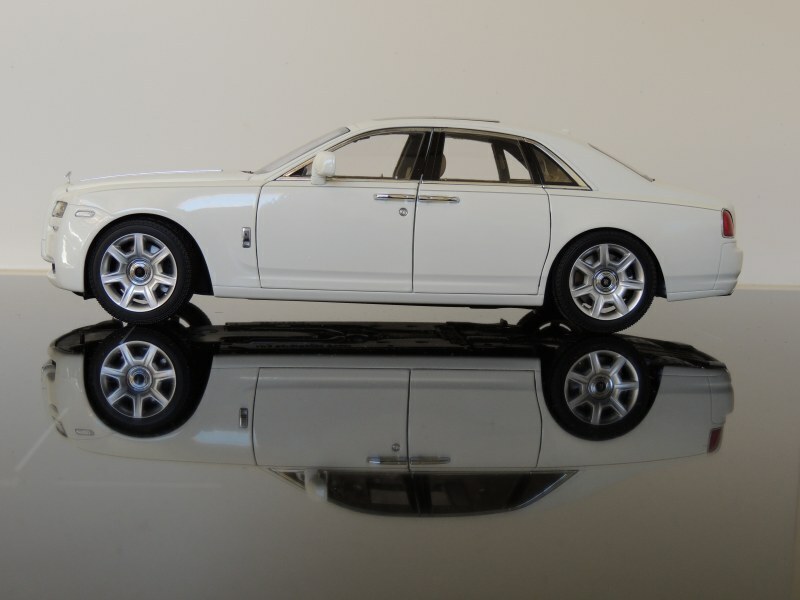 Kyosho’s 1:18 scale replica captures this brilliance… and the associated expense. 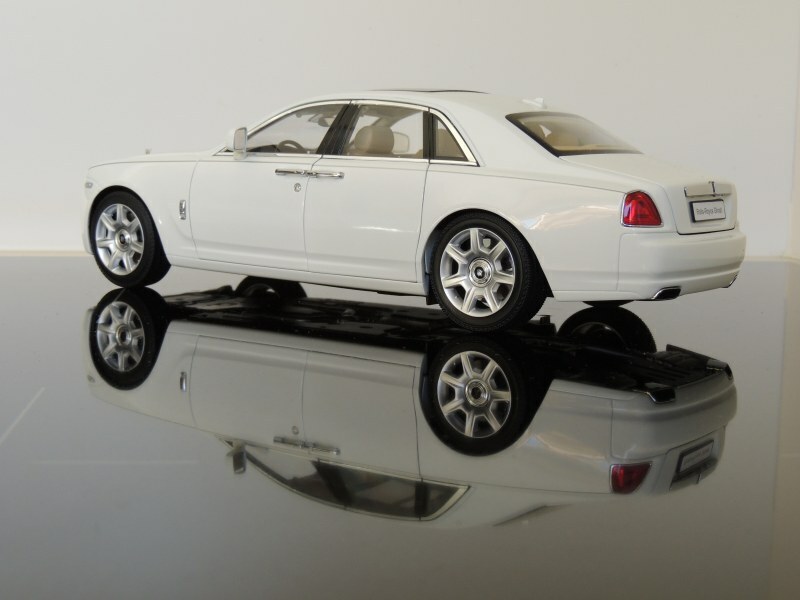 Costing at least $200 in most hobby establishments, the Kyosho Rolls-Royce Ghost is amongst the premium class of diecast models; thus it enjoys a high level of detail, refinement, and function. The lines and creases are excellently sculptured and the paintwork is well applied. This, coupled with the perfect fit of every component into its place means that first impressions – of the exterior – are good. 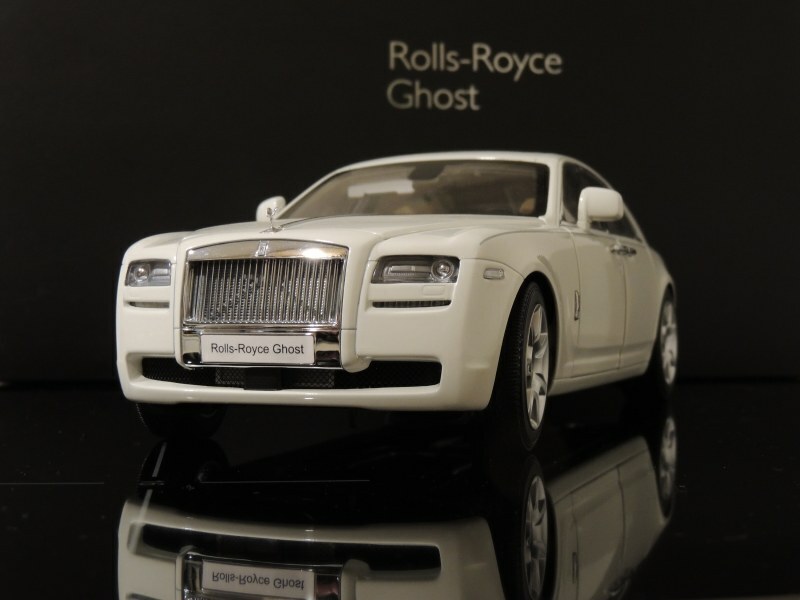 Kyosho offers the Ghost with several paint finishes, some including the traditional ‘Silver Satin Finish’ bonnet. 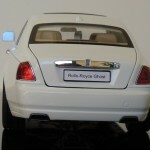 All of the colours do justice to the model, but ‘English White’, in my opinion, is the crisper and cleaner. 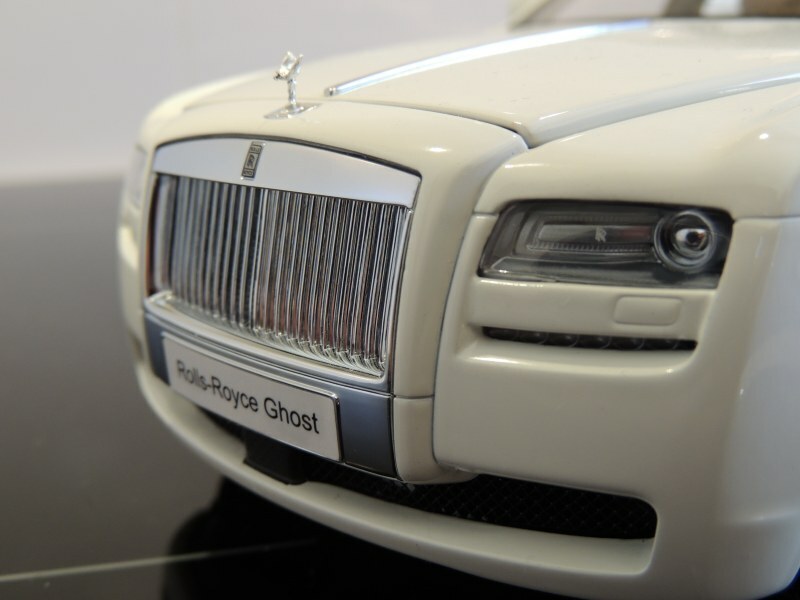 Detail is first-rate – the headlights even have a little ‘RR’ logo painted on them, the ‘Spirit of Ecstasy’ is vividly recognizable, and anything that is carefully studied will impress. 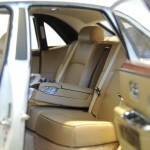 Opening the rear (coach or ‘suicide’) and front (standard) doors reveals an equally impressive interior. A removable, moulded umbrella protrudes out of the ends of both front doors (A function I find impressive. 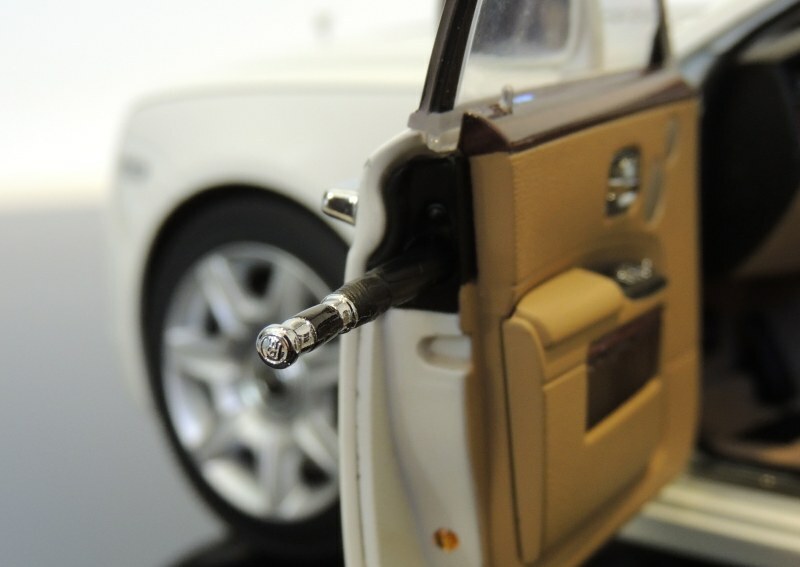 Kyosho could have chosen to just glue an umbrella handle in the door, but instead they were generous and actually modelled two individual umbrellas which can be slid in and out of the little storage cavities). 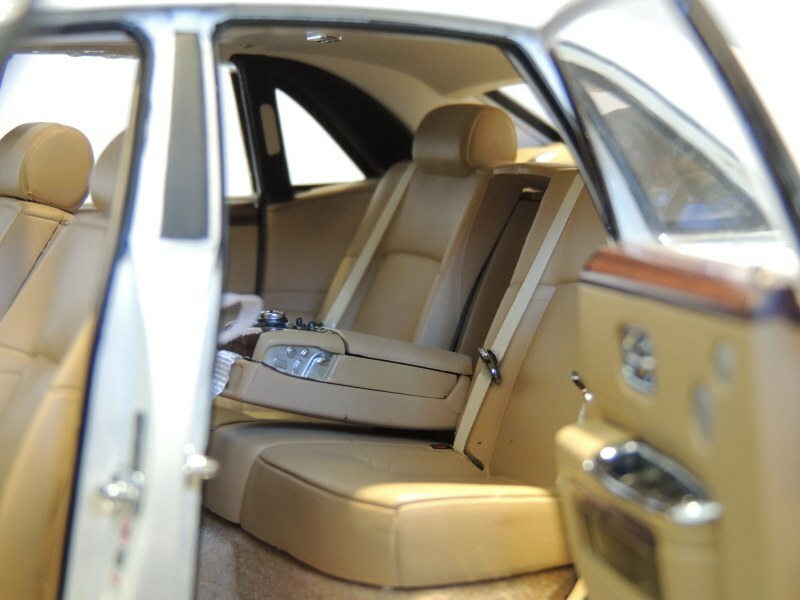 The wood finish, a reoccurring theme throughout the Ghost’s opulent cabin, looks beautifully realistic, while all the chrome is refined and not excessive or cheap-looking. 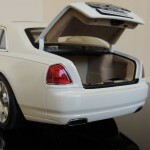 The beige carpet, which covers all parts of the floor, the boot, and even the inside of the boot lid, looks excellent. 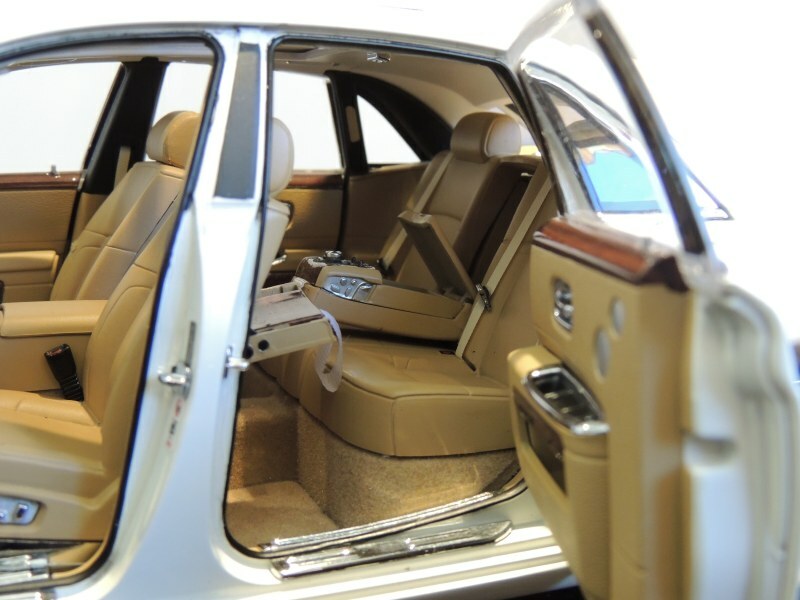 Functions include an opening centre storage compartment, a sliding sunroof cover, folding rear picnic tables, sliding front seats, folding shades, and folding middle rear seat, which reveals the armrests and beautifully rendered screen cursors, as well as a storage compartment which opens! Unfortunately, the white ribbon handles, which allow some of these to open are rather large and inaccurate, but it is but a byproduct in the style vs substance conundrum. The engine bay is actually a plate, but that fact is quite hard to distinguish, as the engine and mechanics rise significantly off the plate. Little warning stickers, painted caps, individual components, and a variety of shades and materials ensure that the engine bay is as impressive as the rest of the model. The only disappointment, however, is in the inaccurate doglegs hinges, which, although there to boost the weak engine struts, tarnish the otherwise refined atmosphere. 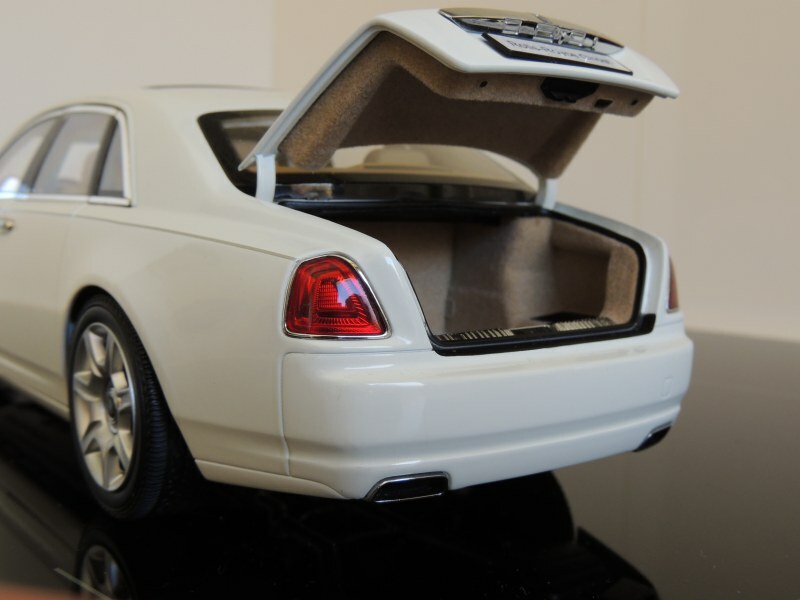 Despite this minor problem, it could be said that Kyosho’s admirable efforts with their 1:18 replica has ensured that every Rolls-Royce Ghost enjoys splendid attention to detail! Some may find their masterpiece too special, and may leave it packaged in its black box (similar to AUTOart Signature boxes), but I, for one, find it worthy of open display. 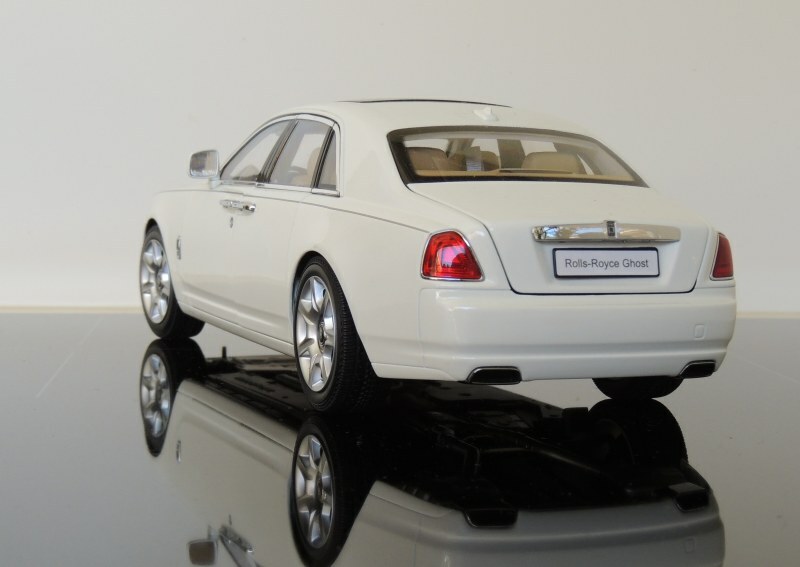 Perhaps it is the pinnacle of diecast automotive prestige. 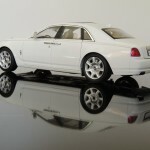 5 Responses to "REVIEW: Kyosho Rolls-Royce Ghost"
I have been a collector for years, yet this model has been the highlight of the hobby. I’d heartily recommend it to anyone. 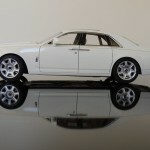 A review that is rhetorically worthy of the Rolls Royce Ghost and Kyosho´s model of it. 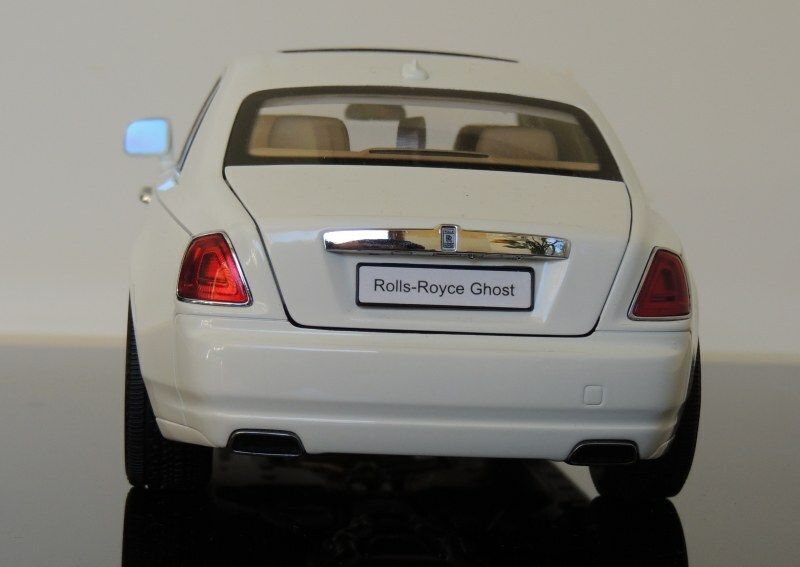 In my opinion, Kyosho´s Ghost is their best Rolls Royce model to date. The slings on the picnic tables spoil the realism a bit, though. This model is wonderful, one of Kyosho’s best model to date. I have it in silver, and I think Ky nailed it. 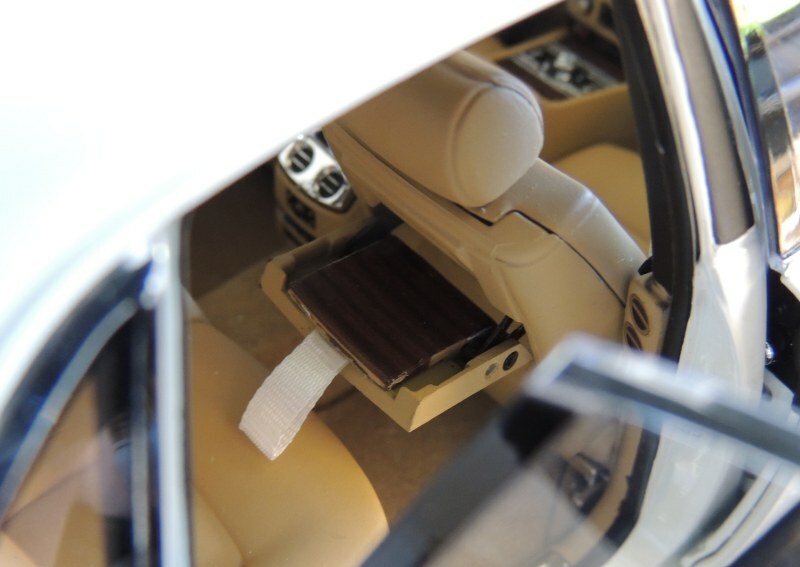 I have this exact model and it is the best interior ive ever seen. 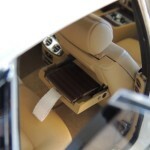 wood quality is incredible and unfortunately not replicated in future Kyosho and Bentley products. Get one while you can.